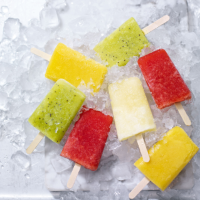 Don’t wait for the ice-cream van, make your own lollies now to have ready in the freezer for those lazy, summer days. If you don’t have lolly moulds, you can use disposable plastic cups and wooden lolly sticks instead. 1. Place the coconut water and your choice of fruit in a blender and whizz until smooth. Add the agave nectar and whizz again, adjusting the sweetness to taste. 2. Divide between lolly moulds and freeze for at least 4 hours or overnight until solid.